The bicycle represented is a generic diamond frame machine from around 1894–97. According to Scotford Lawrence (National Cycle Museum, England), the date is based on the fact that the top tube of the frame slopes up from the seat tube (after 1895, this tube became horizontal). The anatomy of the bike is shown in great detail, including the coiled element on the head tube (part of the brake system) and the oil lamp on the handlebar. 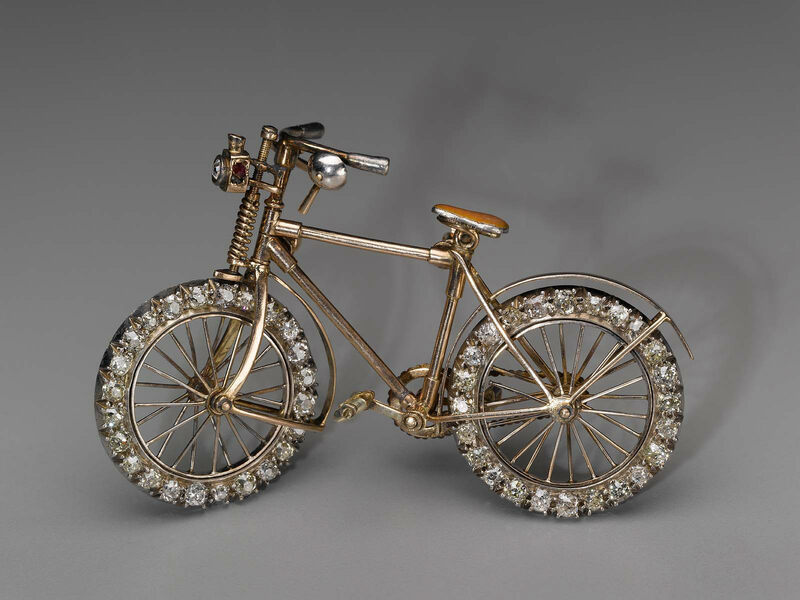 The brooch has several movable parts (the wheels spin, the pedals turn, and the fine bicycle chain turns the rear wheel when advanced). The machine follows British design with two mudguards and brake (American diamond frame bicycles lacked these parts). According to Nicholas Oddy (Glasgow School of Art, Scotland), “It has all the appearance of a so-called ‘cob,’ a small, short-reach, diamond-framed machine designed specifically for women wearing rational cycling dress.” This is a brooch for someone who is at the cutting edge of female cycling fashion, has considerable wealth, and chooses to make a statement about the new found freedom of woman at the height of the suffragist movement.